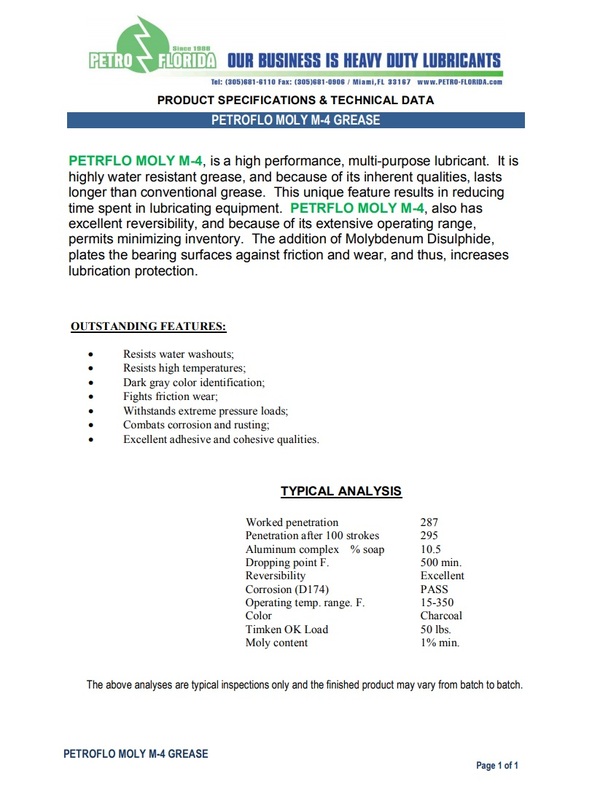 PETROFLO MOLY M-4, is a high performance, multi-purpose lubricant. It is highly water resistant grease, and because of its inherent qualities, lasts longer than conventional grease. This unique feature results in reducing time spent in lubricating equipment. 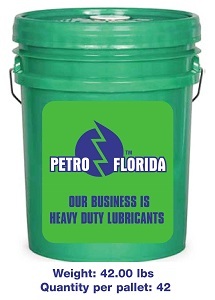 PETROFLO MOLY M-4, also has excellent reversibility, and because of its extensive operating range, permits minimizing inventory. The addition of Molybdenum Disulphide, plates the bearing surfaces against friction and wear, and thus, increases lubrication protection. PETROFLO R.R. CURVE GREASE, is a soft, smooth calcium soap grease containing 12% graphite, as a filler. In railway service, PETROFLO R.R. CURVE GREASE, finds extensive use in trackside lubricators, as a curved rail lubricant. Small quantities are applied periodically to the inside railhead on sharp curves, where it prevents direct metal-to-metal contact between the rail, and wheel flange, and reduces the severe wear which would otherwise result. Because of the extreme pressures generated between the wheel flanges, and rails as heavy trains negotiate sharp curves, the base grease acts mostly as a carrier for the graphite. PETROFLO R.R. CURVE GREASE, is formulated for excellent “carry” on long curves.